Drew Stanton (1% Y! ): It’s Stanton time again as Carson Palmer went down in the 4th quarter on Sunday with what is being reported as a possible torn ACL in his left knee. If that is the case, Stanton would be the starting quarterback for the remainder of the season. He has led the Cardinals to 2 wins in 3 games so far this season without throwing a pick. He played well in relief of Palmer, including a 48-yard beauty of a pass to John Brown for the game-winning touchdown. Stanton has good working knowledge of the offense and isn’t afraid to throw the ball down the field. Given the weapons at Stanton’s disposal, he may be worth a look. Eli Manning (57% Y! ): We all thought Manning would be doomed after losing Rashad Jennings and Victor Cruz. Blasphemy! Even though the Giants are still losing, he’s still done pretty well for himself. Since week 4, Manning has thrown 8 touchdowns to just 1 interception. He played a decent game on Sunday against a tough Seattle defense, passing for 283 yards through the air with a touchdown. He has really connected with Odell Beckham, and the Giants are expected to get workhorse Rashad Jennings back soon. He should help to open up the passing game for New York when he returns. Manning is a decent option if you just lost Carson Palmer for the season. Terrance West (55% Y! ): West appears to have shaken control of the Cleveland’s committee backfield approach after rushing for 96 yards on 26 carries Thursday night, adding a touchdown. Head coach Mike Pettine insists that the Browns will ride the hot hand and the running back situation will remain fluid on a week-to-week basis though, limiting West’s immediate fantasy value. However, West has been really productive over the past couple of weeks and should continue to headline this running game in the weeks ahead. In such a run-heavy scheme, West needs to be owned in more than 55% of leagues. He makes for a solid weekly flex play. Carlos Hyde (33% Y! ): In limited action, Hyde did a hell of a job. He has only 4 carries for 36 yards, but found pay dirt. San Fransisco did a lot of good work on the ground and Hyde may be given more touches in the coming weeks. They have been conservative with aging tailback Frank Gore (he’s only had 20 carries twice all year) for most of the season and Carlos Hyde has shown that he can be trusted, making him valuable to owners even outside the obvious handcuff situation. Stay tuned. Tre Mason (46% Y! ): Mason gained 48 yards on 14 carries Sunday while adding 33 yards on 4 catches; a decent showing for the rookie tailback against a stout Niners defense. Labeled a “committee” by head coach Jeff Fisher, it’s clear that Mason is the lead runner. Not only is he their best option in the backfield, but may be their most talented weapon entirely on offense. Benjamin Cunningham did vulture a rushing score, but saw only 4 carries while Zac Stacy kept the bench warm. Mason should continue to get the bulk of the work for the Rams in the weeks to come, making him ownable in most leagues. 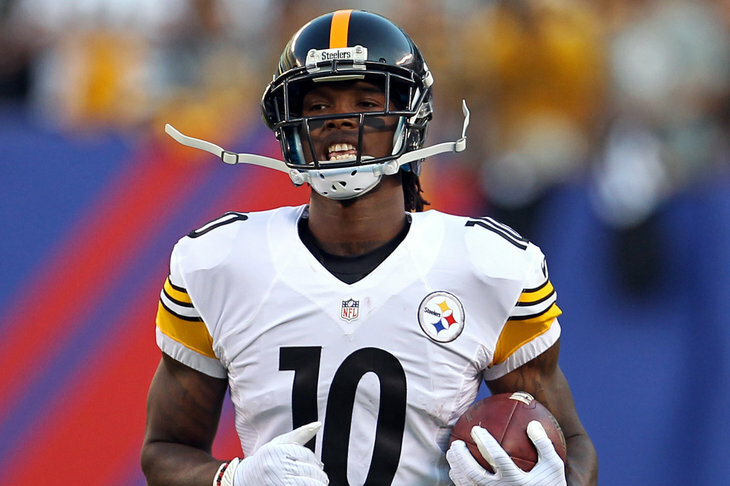 Martavis Bryant (62% Y! ): Another week, another touchdown for Bryant. This is becoming a weekly occurrence for the 6 foot 5 Clemson standout. His touchdowns are usually the product of his ability to find open space in the red zone. However, his week 10 score came on an 80-yard catch-and-run play where Bryant showed off his wheels. Bryant was targeted 7 times and racked up 141 receiving yards Sunday against the Jets, signaling his WR3 upside. Antonio Brown of course dominates Roethlisberger’s looks, which leaves Bryant to fight Markus Wheaton for targets. Bryant played only 50% of Pittsburgh’s snaps on Sunday, but that was to be expected and it is clear that he makes the most of his opportunities. Go get’m. Odell Beckham Jr. (68% Y! ): Not only should this guy be owned, but he should be started in the vast majority of formats. He embarrassed Richard Sherman on a 44-yard pass and constantly won battles against all of Seattle’s corners on Sunday night. Beckham has evolved into the lesser Manning’s favorite target in recent weeks and is putting up big numbers. He’s got 264 yards receiving over the last two weeks to go along with 19 targets and 15 catches. Manning has been having trouble getting on the same page with Rueben Randle and teams are constantly focusing on Larry Donnell, leaving Beckham to reap the rewards. Put all the chips in the middle, this is probably your last call. Mychal Rivera (33% Y! ): Rivera has been a garbage time monster of late. It’s no news that the Raiders just aren’t very good, so it is likely that these scenarios will continue. Both Rivera and quarterback David Carr have been bright spots in in an offense that has otherwise been bad. Rivera has 26 targets, 21 catches and 3 touchdowns over his last 3 weeks, making him a valuable bye-week replacement for those in need. Rivera will likely be usable for the foreseeable future given the connection that he and Carr seem to have. Charles Clay (57% Y! ): Over the past two weeks, Clay has been targeted 17 times. During that span, he’s hauled in 12 passes for 110 yards and a touchdown. Still, Clay has yet to live up to the lofty expectations placed on him entering the season. However, considering how top-heavy the tight end position has been to date Clay is probably worth a look down the stretch. Doug Moore is a fantasy football contributor at The Sports Script. Follow him on Twitter @DMM0822!